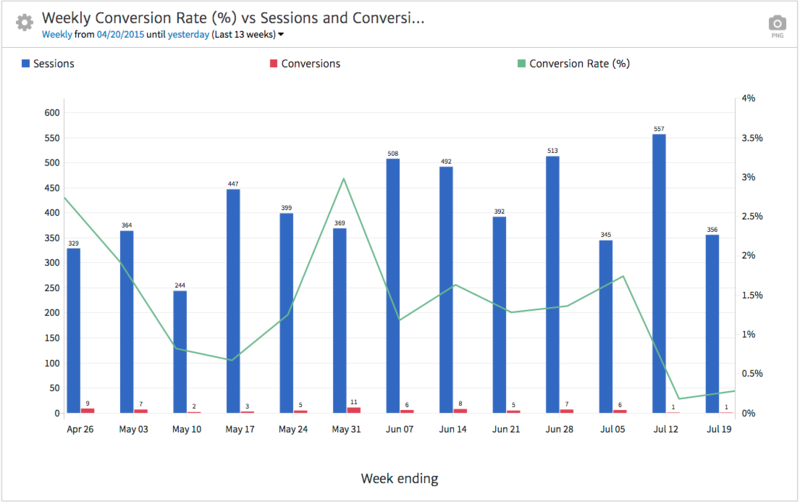 The Goal Conversion widget, shown in the above image, allows you to represent total Conversions, Conversion Rate, and Sessions or Users, all in one graph. This is helpful when showing how traffic volume correlates to conversion performance. Now, let’s look at customization options available within this widget, which you can see by selecting the gear symbol in the upper left. First, you can select the date to compare periods on a daily, weekly, monthly, or quarterly basis. You can also define the date range for which you’d like to see stats. 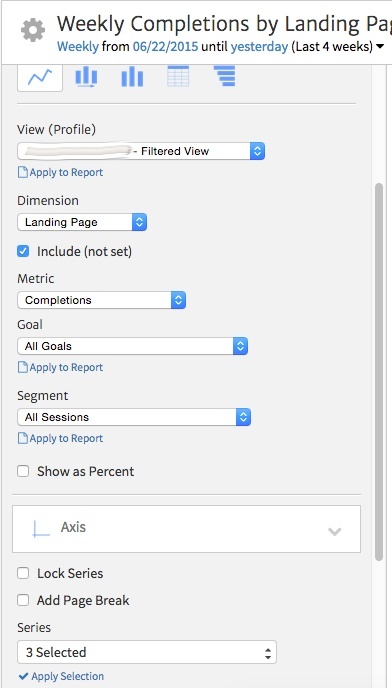 Under the Metric dropdown, you can choose to show Conversion Rate (Conversions/Sessions) or User Conversion Rate (Conversions/Users), represented in the line graph. Your choice of metrics depends on whether you want to show likelihood of conversion based on the number of total visits or based on the number of unique individuals visiting. Via the next dropdown, you can choose a specific Goal to show (by default, “All Goals” is selected). For example, we have it set to track form submissions via an “Apply Now” page. 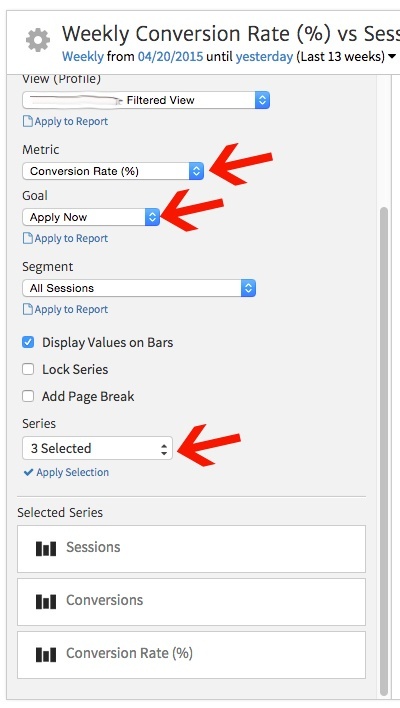 If your Analytics account contains multiple Goals, selecting one here will allow you see performance for one particular action on your site. For example, you may want to track submissions of a school application form separately from submissions of a generic contact form on your site. Once you’ve selected a Goal, click “Apply to Report” to update the graph. The Conversion by Landing Page widget allows you to break down conversions based on where people entered your site to hone in on where conversions occurred. This widget shows a list of landing pages (entry points into the site) along with Completions (another word for Conversions) and Conversion Rate for each. The data here helps to show what pages on the site are most important for driving people to convert. Once again, selecting the gear symbol shows us options to customize the widget. First, you can choose from five different types of charts to represent the data, including a line chart, bar chart, and table. Next, you can select a Dimension, choosing to show either the landing page or the landing page title. This is helpful as some clients may be confused with just seeing a list of landing page URLs and would be able to interpret a report more quickly by seeing a list of page titles. Next, you can set whether or not to include cases where the Dimension was (not set), for example, when Google Analytics did not record a page title. This setting may help in excluding spam referrals or extraneous data. The “Exclude Traffic” dropdown can also help to filter out extraneous data by choosing to exclude landing pages that make up just a tiny percentage of traffic. This is helpful when you want to look at conversion rates and need to weed out the low traffic pages where one or two conversion can skew the results. You can choose from various percentage points to exclude, between 0.1% and 2%. Just as in the Goal Conversion widget, you can use the Goal Conversion dropdown to show data for one specific Goal, if desired. Finally, you can select the metrics or dimensions you’d like to show in report columns or series (depending on the type of chart you’re using). This widget also lets you compare data to previous date ranges so you can see how landing pages have improved or worsened in contributing to conversions. Simply use the date selector at the top of the widget and select “Compare To” along with the previous period for comparison. Use the Conversion by Channel widget to show how users who have converted found your site. This will pull from the default Channels in Google Analytics (Direct, Paid Search, Organic Search, Display, Social, etc.) and correlate with Completions, Conversion Rate, and other metrics, depending on how you choose to set it up. Note that channels are associated with conversions using last click attribution provided by Google Analytics. This widget offers quite a few options for customization. First, you can choose from seven different types of charts to represent your data—like a time series bar chart, pie chart, or area chart. For metrics, you can choose from options like Completions, Conversion Rate, Users, Sessions, and Bounces. 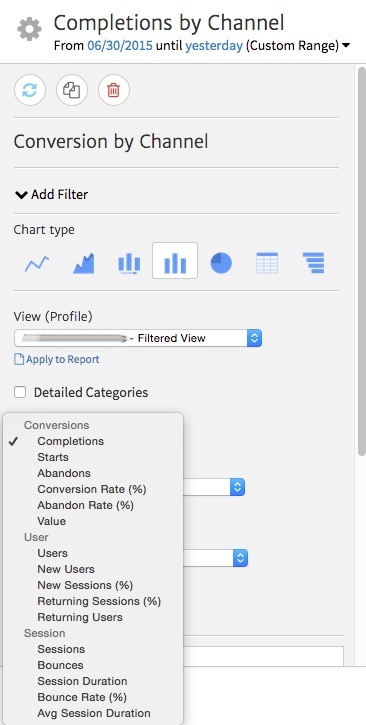 For example, if you’d rather show how many people started or abandoned the conversion process, you can do so in addition to showing Completions and Conversion Rate. Or you can choose to show User- or Session-based metrics. 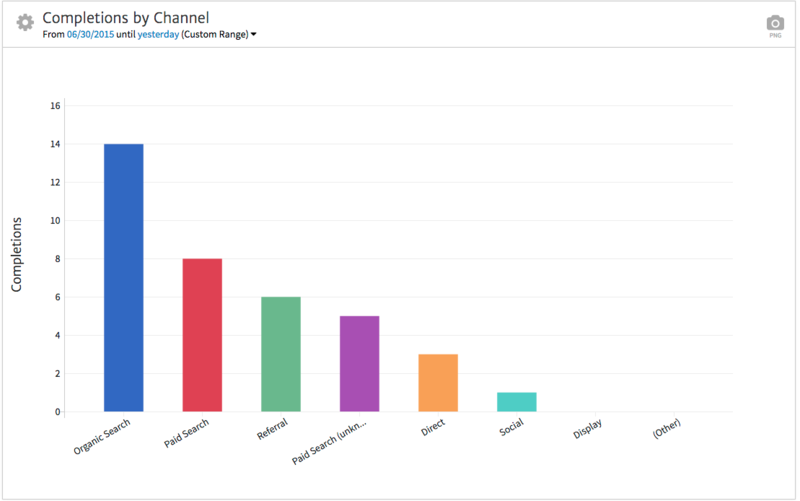 Depending on the type of chart in use, you can choose the Channels you’d like to include from the Series dropdown. That way, you can compare organic vs. paid search, or show only paid channels (paid search and display) if you want. If you’d like to compare the effectiveness of mobile, tablet, and desktop in contributing to conversions, use the Conversion by Device widget. This will allow you to look at total Conversions or Conversion Rate based on the devices people are using to access your site. In a report, this widget helps to show both the device-using habits of a website’s audience and opportunities for improvement if conversion performance lacks on mobile. 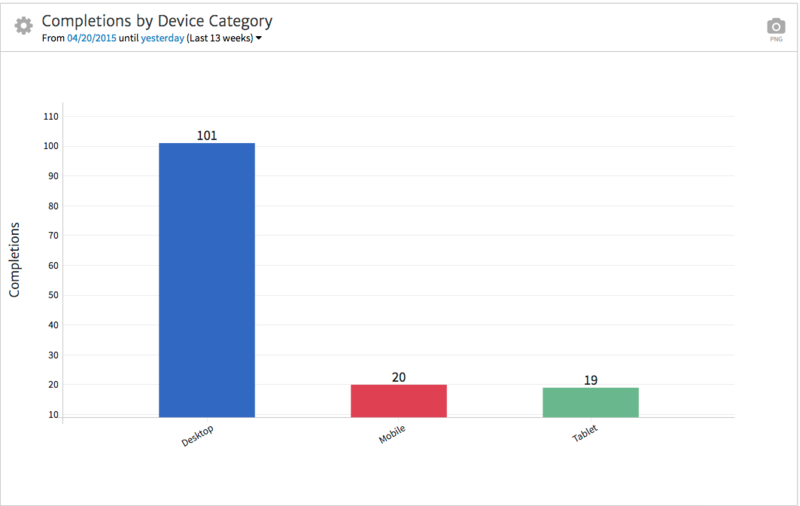 The widget starts off segmented by device category (mobile vs. tablet vs. desktop), but you can get much more specific in the widget options. 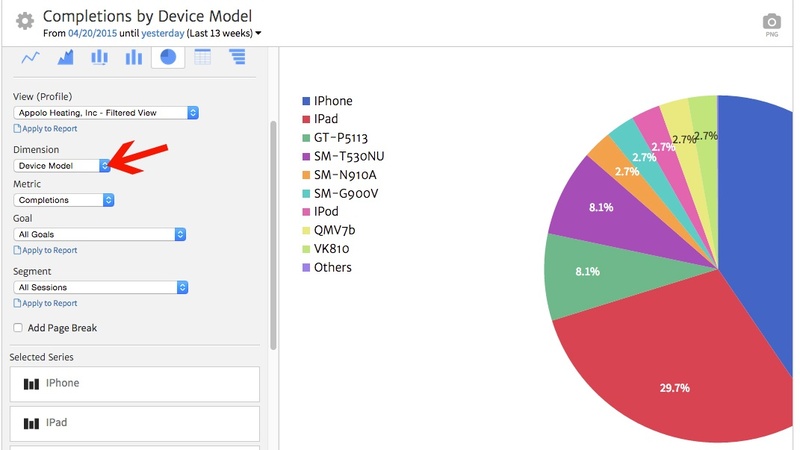 For example, if you wanted to see what percentage of your users come from iPhones vs. other phones, you could change the dimension to Device Model. Other options under the Dimension dropdown (useful especially for showing developers technical details about website users) include browser, operating system, device brand, and mobile device info. Next, you can change the metric from Completions to show other stats such as Conversion Rate, Users, Sessions, etc. These are just a few of the conversion-related widgets in Megalytic, but we’ve covered a number of use cases for breaking down conversion data. When reporting on conversions, you want to consider much more than just total conversions, taking into consideration factors like how converted users found your site, where they landed, and what devices they were using. The key to successful reporting (made easy by Megalytic) is not just showing the data but customizing it to represent what’s most important to your client or boss. Add conversion widgets to report on how successfully a website is driving in leads or sales, and tweak those widgets to show that data in a way that makes sense to the person reading the report.